Midtown Manhattan is home to some of the city’s best food, but when it comes to pizza there isn’t a single place which people swear by. That is about to change. 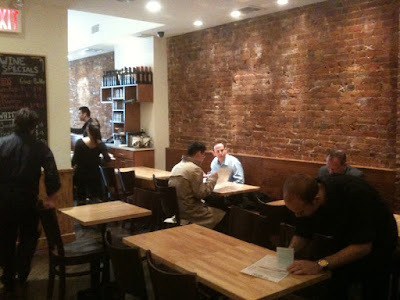 Earlier this month, word spread that a “speakeasy” pizza place had set up shop in the upstairs level of a cafe. And when Midtown Lunch reported this week that there was a $6 lunch special on the menu (available until 3PM), I had to swing by and check it out. 57 Napoli Pizza e Vino (120 East 57th Street) is located on the second floor of C’est Bon Café and once word gets out, I guarantee you this 50-seat spot will be packed for lunch every day. For the quality and quantity of pizza you get, it can’t be beat. You get a personal 10 inch pie which will cost you just $6.53 with tax. Considering two slices at a sub par pizza place in Midtown will run you about $5.00 these days, I think the extra $1.53 is well worth it for a personal pizza… made from scratch in front of you… and topped with fresh mozzarella & basil. 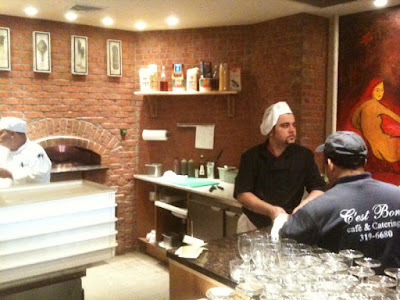 Manning the oven is Salvatore Olivella who has previously worked at L’asso and No. 28. 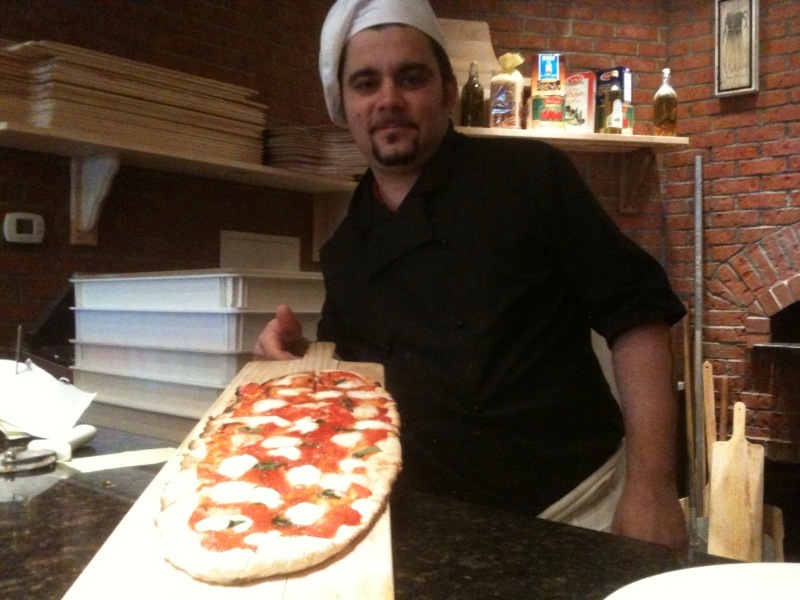 When I stopped by, Salvatore was hopping around the kitchen, tossing dough in the air, shoving pies in and out of the oven, and making small talk with customers. The place is pretty bare bones for now and one downside is there isn’t really a spot to wait for takeout orders. The other trade off is that because each pie is made as it’s ordered, there’s about 15 minute wait per order. 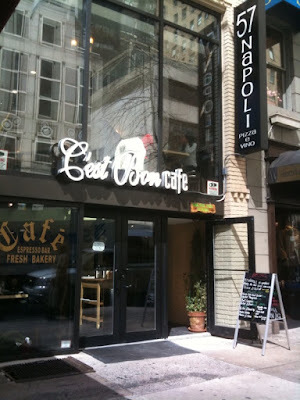 It’s definitely not a quick bite, but rather a nice and cheap place to sit down with some coworkers for a leisurely lunch. One problem I generally have with many sit down pizza places is that you usually end up spending $15 on a delicious pie, but don’t leave feeling particularly full. 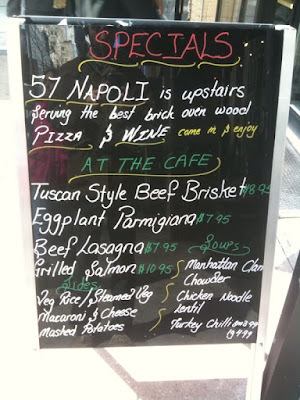 You won’t feel stuffed by a 10 inch pie at 57 Napoli Pizza e Vino, but it’s quite satisfying for only $6. Heck… if you’re starving, downing a second pie is definitely doable. My only hope is that this place doesn’t become a complete madhouse like some burger places not too far away (Shake Shack, Burger Joint, etc). But for pizza like this… I will wait! * Update: It’s been brought to my attention that although the pizza in the photo above was served to me as the $6.00 lunch special, the typical $6.00 pie does not include fresh mozzarella and basil. That being said, your best bet might be splitting a Buffalina D.O.C. pie (featured in photo 1 with Salvatore) with two friends. 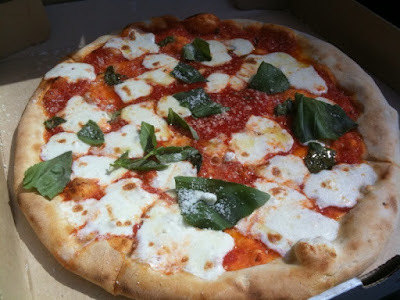 The pie has tomato sauce, fresh buffalo mozzarella, olive oil, and basil. It costs $22 — or about $8 each with tax. Next: J. Lo Folds Her Pizza. OMG!